I took two pair of shoes to BlizzCon/Disneyland. One pair is a pair I use when I do inspections and have to be on my feet for a time. The other pair, I purchased specifically for the vacation, knowing I needed a comfortable pair for walking. My inspection shoes turned out not to be very good. I got a blister on my right foot the first day at Disneyland so wound up wearing the other pair. But, because both are Clarks, the new pair turned out to be a godsend for my tired feet. I wore them all day Sunday at Disneyland and on Monday's trek home. I set them aside for a couple of days and came back to them later that week. Something was awry, however. There was a sound; a "click, click"; coming from the right shoe. These have a soft rubber sole with what seems to be a spandex and canvas upper. They are lightweight, but sturdy for walking around doing inspections. I should go get another pair as they are very comfortable and came in several different colors. But none of that should have a "click click associated to it. After puzzling over it all day on Friday of that week, I came home from work, took off my shoe and turned it over. One of the things people can do is collect and trade Disney pins. They buy cards and can, throughout the resorts, shops and amusement parks, trade duplicate pins for pins they don't have. These are just like tie tacs with the squeeze clasp on the back. 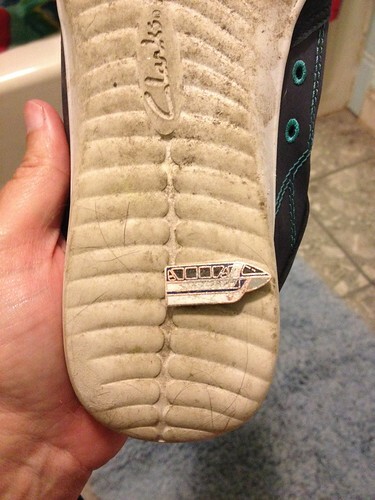 That's a monorail pin stuck in the bottom of my shoe. I would have picked it up most probably at Disneyland on Sunday or, possibly, at the airport on Monday when I left. It did not penetrate the sole and I wouldn't have known it was there except for that annoying "click click" noise when walking across uncarpeted surfaces. Having been on the bottom of my shoe for almost a week, it was a wee bit worse for wear. This caused me to wonder. So many people wear flip flops or flimsy sandals to parks which have this pin trading available. When one's feet are uncovered like that, a pin like this would cause real pain and injury. How many foot injuries does Disney treat daily which could be pokes? While the parks are kept wonderfully clean, this pin was upside down. I never saw it. The length of the shank would go right through some of the flip flops I saw. I wouldn't want to be impaled by Mickey, Snow White or the monorail. If ever I go back or go to another amusement park, I won't be wearing anything other than full foot coverage. I need the support for walking, to being with, and the sturdiness for my RA, so, other than wandering about my property, you won't see me in flip flops. Consider this a PSA for watching where you step and for wearing appropriate foot gear, even at the happiest place on earth.